Small snakes and stable ground allowed? Sure. Basketball court with three or four pissed-off garter snakes is no problem. 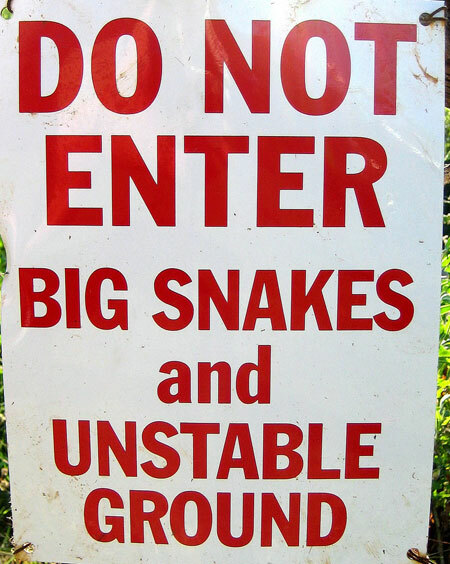 I am very careful when I enter the big snakes tho. Great image of a Hils-shaped bullllggge inside annoyed-looking snake. Man, all we have here are squirrels and dead volcanoes. I want one that says, “Big Snakes and Unstable Personalities”. I think there are parts of my brain that have this sign outside them. This is really funny on my friend’s page right next to Hil’s Snakes on a Head posting. That is not a warning. That is a sign to tell you where the party is! This sign is such an invitation. Really, though, there’s only a probability of big snakes, since they do move.